No Man's Land? : IPL @ Kerala! Home kerala sports IPL @ Kerala! Its champagne time for the sports lovers of Kerala, especially Cochin, when the vibrant Kerala port-city snatched one of the just two spots available for the prestigious IPL T20 Cricket teams. This could well be a shot-in-the-arm for Cochin and for the overall cricket/sports development of Kerala as this new cricket avatar called IPL may well be the beginning of a new era in our sorry sports tale. I'll tell why in a minute. Facts first: its the hitherto unheard of Rendezvous Sports World Limited, a consortia of a few real estate biggies viz Anchor Earth Pvt Ltd, Parinee Developers, Anand Shyam Estates & Developers, Film Wave Combines Pvt Ltd and private investor Vivek Venugopal (Elite Group, Trichur) that gobbled up the Cochin franchisee out of nowhere. The group fished out a cool 1530crore green bucks for the cricket team, ahem! In fact this Cochin team and the other one bought today, the Sahara India's Pune franchise shelled out more than what the first 8 teams were valued together during IPL- I. Incredible! But when the 3 big money makers of Indian economy, the Bollywood, Corporate World and the Cricket Duniya come together who wants to be a skeptic. Acting the Devil's Advocate here , just 2 teams are managing to show some green in their balance sheets from the last 3 years of 'business', amazingly the persistently losing Kolkata team carried by Shah Rukh is among them! Ah, when you invest such barbarian sums you have to give yourselves some time. But it's not just the money which gladdens my heart about this IPL dinghy, its the hope of this one benefiting the whole community is what attracts me. IPL Cochin or rather it is called IPL Kochi, is going to propel the name of Cochin and Kerala to much more dizzier heights. Minuscule, some may think, but in this globalized world everything matters, especially when its country vs country, city vs city and even panchayath vs panchayath when attracting investments and nurturing their societies. The EPL has demonstrated how well sports could be used to the benefit of the whole city. Surely many of us wouldn't have bothered about the western English town of Manchester if not for the glorious Manchester United team it hosts. And the two football teams this English city own have influenced the culture and economics of the city in a big way. I don't see why IPL would not replicate such a success tale in Indian cities given the popularity of the game in the nation. 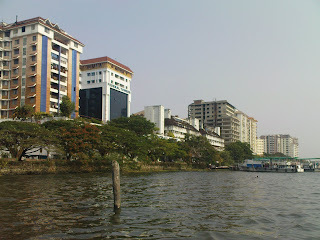 Cochin is building its own stadium off the pristine shores of Edakochi to be the host ground of the new IPL Kochi team. The Kerala team wouldn't have been possible if not for the enterprising and cricket-enthusiast MP of Trivandrum, the charismatic Dr. Shashi Tharoor. Quoting Mr. Lalit Modi, the father of IPL, it was Tharoor who was instrumental in bringing together the consortia and presenting Keralaites with their own team, negotiating the strong contenders from Ahmedabad, Rajkot, Nagpur etc which had a better cricketing culture that ourselves. It may take a good while before IPL grows into a much bigger and wider spectrum, knitting well into the community it supports. Is it too tall a hope to see multiple teams from the same city, like London having as many as 4 major EPL teams, but I think eventually second divisions will evolve for the competition. With decks being cleared for a cricket stadium to be built in Trivandrum (as a part of the 35th National Games) I hope the Kerala IPL team would be playing in my home-town as well. I just heard NDTV speculating that this guy, the one you see here, might be captaining the IPL Cochin team.. Now, sorry for being rude and cheeky, but we haven't done that many sins to deserve this, have we?? Sorry Sreesanth, you've been a very very poor ambassador for our state.